People justifying why the police shot the victim and bringing up criminal pasts. People rushing in to say that All Lives Matter or Blue Lives Matter. 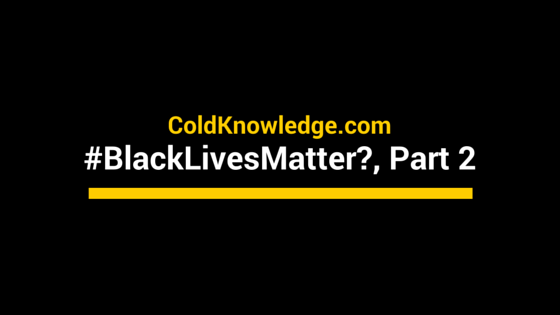 Bringing up black on black crime. There are so many people that I use to consider decent human beings from when I was growing up or ran across from my time in the military showing their true feelings or lack of intelligence in the wake of all of these shootings. A lot of them are former police officers or military personnel so I know where their frame of mind is in terms of being loyal to the shield, even at the cost of looking stupid rather than speaking out against the morally corrupt. To be honest if these people consider them their bothers and sisters even after all of the evidence points to there actually being a crime, then I simply don't want to know these people anymore; because I never knew them in the first place. But hey, that just the way life goes sometimes in the wake of major incident in this country; you'll eventually see the true person's to the left and right of you feelings about you. For this to be a country where they preach everyone has the same rights as the person standing next to them there is sure is a lot of people who can't understand the simple notion of why Black Lives Matter started in the first place. It's a simple Google search away to see that we're not promoting our race to be better in any shape or form to be any better than others. That we are not saying that our race, (who has been oppressed for literally hundreds of years since coming to this country), wants to be the dominant or "master race" as I've seen it called so many times in the news and online. We are also not saying that whatever we do or think about doing is any better than the next person's ideas or dreams. We are simply saying that we want a chance at living freely in this country too. But no, most people don't want to actually sit down and research things on their own time. They rather sit her and listen to a bunch of podcasts and news clippings that either blatantly lie or twist stories to gain them more ratings. This is a classic bait and switch move called propaganda that keeps the public in darkness and fear so that a political or financial agenda can be pushed upon the masses to do what the few want them to do. If you don't believe me you can, you know, look it up for yourself. It's just like in my post from 2015 called Pushing For Propaganda where I told my readers then how these news networks do it for ratings and to incite more wartime violence. There's literally proof as to what they are doing in times like these. But like I said before, people will never know simply because they don't want to do the research. I don't know where the disconnect is with people and the way that they think, but thinking that Black Lives Matter movement is anything other than a peaceful demonstration that wants to show what black people go through in America on a daily basis is a demonstration in unintelligent thinking. Black people want to do nothing more in this country but to just love their family, create beautiful works of art and to make life better when we have the chance to. To acknowledge the fact that there is black on black crime going on here is pretty redundant seeing as there is just not, if more, white on white crime. The black on black crime comes as a result of living in poverty for most of their lives and seeing the discrimination lobbied against them from all angles. That in turn will make any sane person act out in that matter. So that whole point is mute when no one wants to help those people, rather they sell them off like cattle to the highest contracted prison. Put things are finally getting to the point of being tired isn't an option anymore. I personally don't believe in protesting anymore for the simple fact that it doesn't work. Any time something like this happens it is shown to us time and time again what they think of us to the point of letting anyone involved in anything off the hook for any wrong doings. There is literally videos of African Americans getting shot or violently handled without any kind of repercussion to the parties involved. The way that we go about this has to change and it starts with us. I know that a lot of people are sick of hearing that because they feel as though any number of things that we do simply won't work. But that's not true and there are plenty things that we can do that will work when we come together as a people. It's a long, hard and dark road because of the people that seek to do us harm; but I know that as a race, as a special group of people, we can do it. It's finally time for those who are financially better off to reach back into the community and help promote these younger generations who want to be doctors so that we know what's being put into our bodies and what drugs to stop taking. It's time to reach back and pull out those youngsters who want to be educators so that we are teaching our history and not forgetting where we came from and what we've been through here; that way we are learning where we can go as people. We have to reach back and grab those kids who want to hold those elected offices and make sure the right laws are passed that protect the elderly, the poor and the mentally ill; those offices being key. We have to make sure that we have those kids who want to be better than the police officers that they see, become one so they can show they know how to protect and serve people. It's time that we show them the strength that we have when we come together as one. Marching is all good and dandy, but it's time to start going after these positions of powers that seek to keep us down. That means on every single level there is possible to get to, just so that we can show them the America that we want to live in, a peaceful and just country. I went to the rallies, I marched against the violence, now I see that it's time that we start promoting the best and the brightest that we have to offer from us as a people. I feel that's truly the only way that we can tip the scales against racism, against police brutality, against classicism, against everything morally and unjust in this country. It's time to educate and support our youth, disarm the racists who hate us for no other reason than the color of our skin and those who seek to divide us for monetary gain. And most importantly it's time for us to lead the way into a better life in this country. Quite frankly the countries fate is hanging in the balance on us doing so. We as nation will fail like so many great nations throughout time, simply because no one was willing to learn and make that all important change against every single thing that is wrong in this world. We are the United States of America, there is zero reason for the way this country is being ran and the conditions that it's most of it's citizens live in. At the end of the day we just want you to know that Black Lives Matter, we want to live freely just like you.